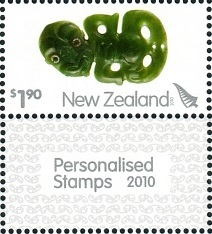 Personalised Stamps have been issued in a number of formats since 2001. 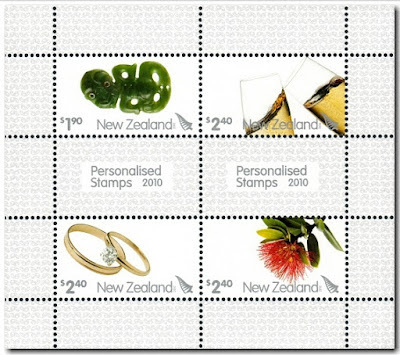 The basic idea is that you add your own photograph or logo to the one provided by NZ Post. 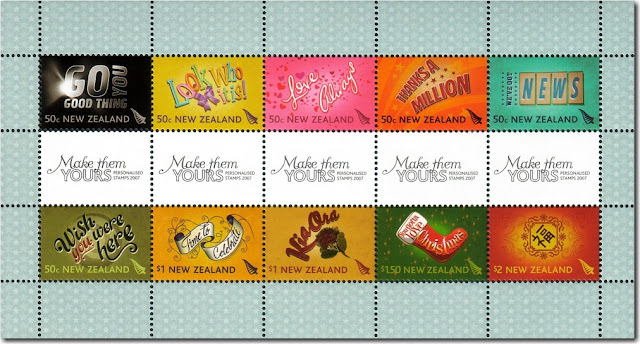 Your personal stamps are then created and sent to you. 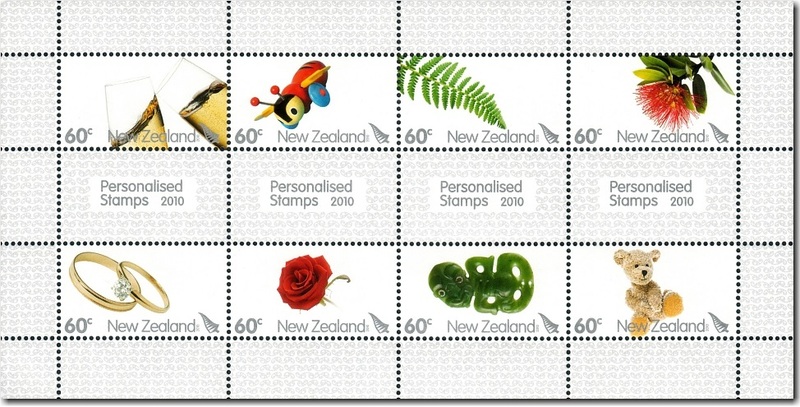 While there is an extra cost involved you do get a postage stamp the is uniquely you. In this post, we intend to show you each issue listed by year on the one page. There is not much description needed and in many cases, the same design appears a number of times with different values. In some cases, the same stamp has appeared twice in the same issue with different values too. 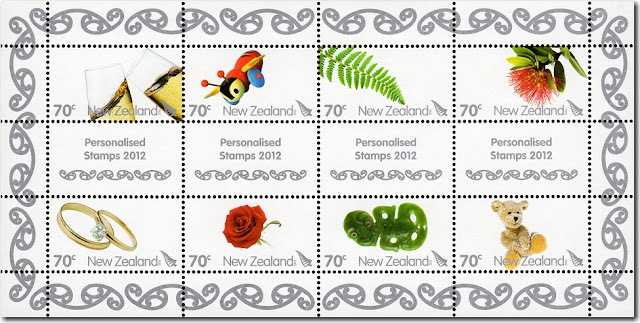 While this may not turn out to be the most popular post on this blog we all thought these issues need to be covered as they are genuine stamps able to be used for postage by their purchaser. 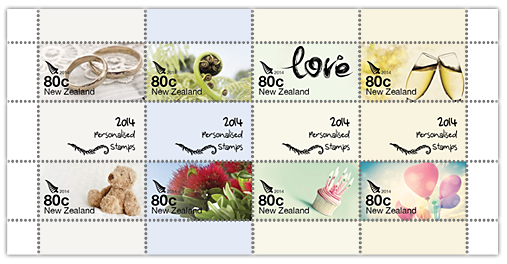 Before Personalised Stamps, there was a series of four issues known as Greeting Stamps. 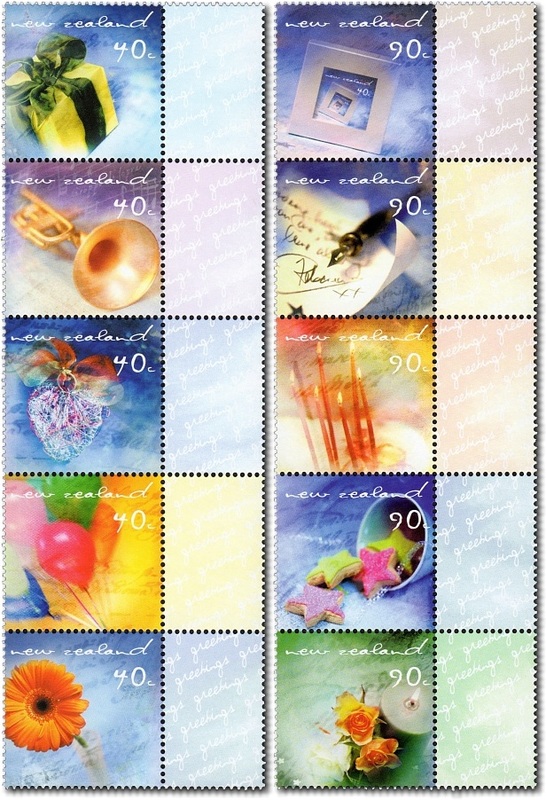 These began in 1988 and went through until Personalised Stamps began in 2001. 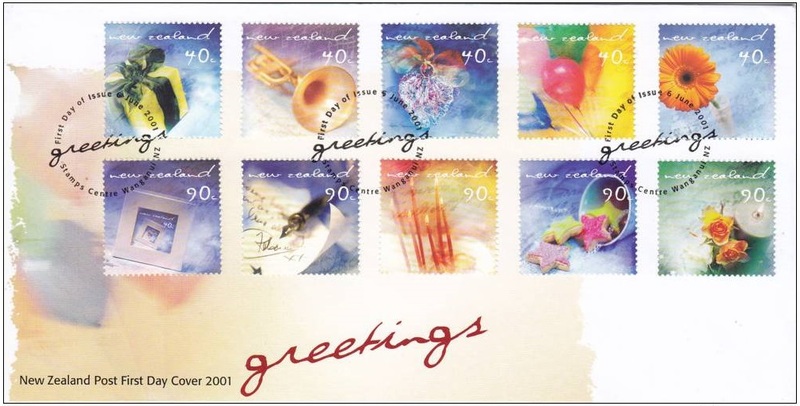 The first two issues of Personalised Stamps from 2001 and 2005 could also be considered as Greeting Stamps two so we have included them here and in our Greeting Stamp collection. Left-hand Strip:- 40c Present with Bow; 40c Trumpet; 40c Heart Shaped Gift; 40c Balloons; 40c Gerbera Bloom. Right-hand Strip:- 90c Photo Frame; 90c Letter / Fountain Pen; 90c Cake / Candles; 90c Star Shaped Biscuits; 90c Roses / Tea Light Candle. First Day Cover - 6th June 2001. Top Row:- 45c Kiwi; 45c Pohutukawa Flower; 45c Champagne Flutes; 45c Balloons; 45c Gold Rings. 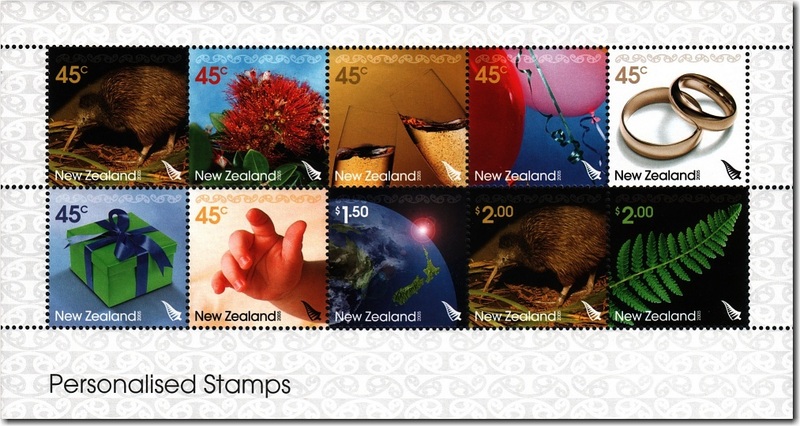 Bottom Row:- 45c Gift Box; 45c Baby Hand; $1.50 Planet Earth; $2.00 Kiwi; $2.00 Fern. 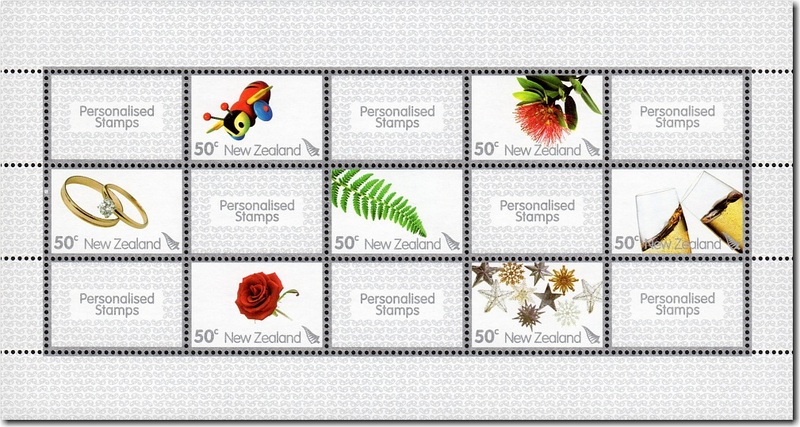 Top Row:- 45c Champagne Flutes; 45c Buzzy Bee; 45c Fern; 45c Pohutukawa Flower; 45c Stars. Bottom Row:- 45c Wedding Rings; 45c Red Rose; $1.50 Fern; $2.00 Pohutukawa Flower; $2.00 Stars. 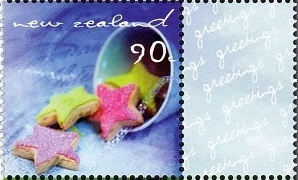 2006 Personalised Stamp - 45c Stars. The Designs:- 50c Buzzy Bee; 50c Pohutukawa Flower; 50c Wedding Rings; 50c Ferns; 50c Champagne Flutes; 50c Red Rose; 50c Stars. Top Row:- 50c Go You Good Thing; 50c Look Who It Is; 50c Love Always; 50c Thanks a Million; 50c We've Got News. Bottom Row:- 50c Wish You Were Here; $1.00 Time To Celebrate; $1.00 Kia Ora; $1.50 You Gotta Love Christmas; $2.00 Good Luck. The Designs:- $1.80 Heitiki; $2.30 Champagne Flutes; $2.30 Wedding Rings; $2.30 Pohutukawa Flower. Top Row:- 60c Champagne Flutes; 60c Buzzy Bee; 60c Fern; 60c Pohutukawa Flower. Bottom Row:- 60c Wedding Rings; 60c Red Rose; 60c Heitiki; 60c Teddy Bear. The Designs:- $1.90 Heitiki; $2.40 Champagne Flutes; $2.40 Wedding Rings; $2.40 Pohutukawa Flower. Top Row:- 70c Champagne Flutes; 70c Buzzy Bee; 70c Fern; 70c Pohutukawa Flower. Bottom Row:- 70c Wedding Rings; 70c Red Rose; 70c Heitiki; 70c Teddy Bear. 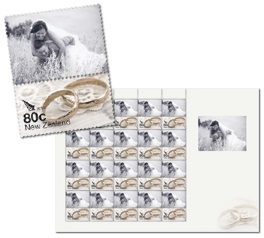 Top Row:- 80c Wedding Rings; 80c Fern; 80c Love; 80c Champagne Flutes. Bottom Row:- 80c Teddy Bear; 80c Pohutukawa Flower; 80c Birthday Cupcake with Candles; 80c Balloons. Designs:- $2.00 Wedding Rings; $2.00 Fern; $2.50 Champagne Flutes; $2.50 Pohutukawa Flower. 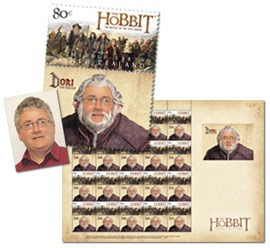 2014 The Hobbit Personalised Stamps. This design of personal stamps is the best I've seen. You upload your own photo and place the image, hair and other features of one of the dwarfs over the top, leaving only your face showing. Using the editing tools provided you carefully fit the two images together until you achieve a result you like. It might be necessary to try more than one dwarf image. 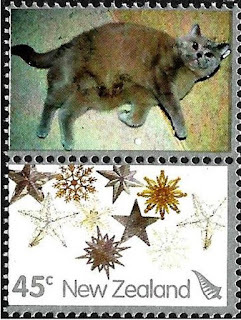 Once done you use the image created to make your own postage stamps. 20 stamps will cost $25.90. Personal stamps using the dwarf tools. Personal stamps using own photograph. 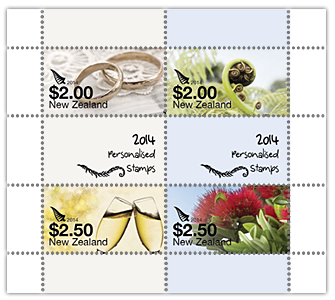 In 2016, the old 80c Personalised Stamps had to be replaced with $1.00 stamps. In this case, the values changed but the designs stayed the same. Top Row:- $1.00 Wedding Rings; $1.00 Fern; $1.00 Love; $1.00 Champagne Flutes; $2.20 Fern. Bottom Row:- $1.00 Teddy Bear; $1.00 Pohutukawa Flower; $1.00 Balloons; $2.20 Wedding rings; $2.70 Pohutukawa Flower. 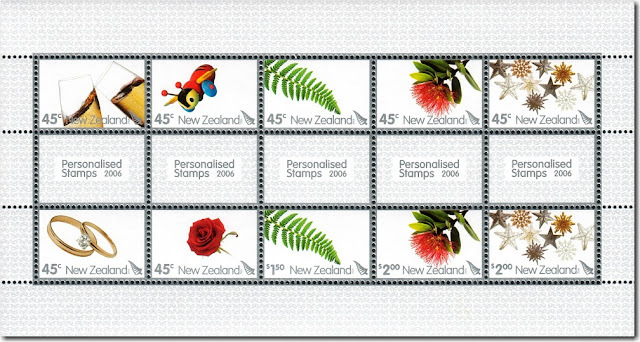 In 2018, the older Personalised Stamps had to be replaced with higher values stamps due to the annual declining mail volumes resulting in the rising costs of mail services. Again, while the values changed, the designs stayed the same. Top Row:- $1.20 Wedding Rings; $1.20 Fern; $1.20 Love; $1.20 Champagne Flutes; $2.40 Fern. Bottom Row:- $1.20 Teddy Bear; $1.20 Pohutukawa Flower; $1.20 Balloons; $2.40 Wedding rings; $3.00 Pohutukawa Flower. 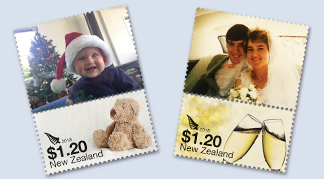 Here is are some examples of how full personalised stamps look with a personal photograph or design at the top and the NZ Post design with the value etc at the bottom.